And the results are gratifying: as usual, I don't kill anyone or break any bits of the plane, and modulo a few of the usual recurring Death Grip problems and some rusty radio work during the first 30 minutes or so, I fly mostly to PTS standards and feel pleased with things VFR and IFR (the first time around the CCR LDA 19R approach was about the best I've ever done it). Cool! 2SP turns out to be a very nice 2001 172S that the owner (and the club) does not let students use for primary training. The checkout's a bit of a non-event -- yes, there are thirteen fuel sump drain points to be individually checked on preflight (at least three of which spray fuel everybloodywhere all over face and hands (as I discover), and yes it's got a fuel injected 180 hp engine that can be a little difficult to start -- but there's nothing about actually flying it that's much different from 4JG (and of course, unlike Lou's Arrow, it has fixed gear and prop so it doesn't require a complex endorsement). 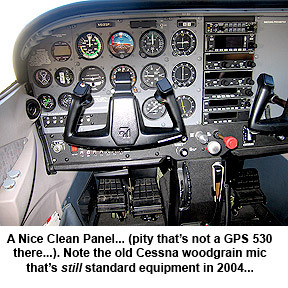 2SP's panel is fairly conventional (with individual instruments that are much nicer than the corresponding ones in most of the other club aircraft -- even the ADF looks like something out of the 90's rather than something from WWII), but augmented by an IFR-certified KLN 94 GPS unit. I don't really get to use the GPS on this flight, mostly because I didn't have time to download the manual from the website, but it seems to have all the right bits in all the right places, and looks fairly decent, if a lot less visually gratifying than the Garmin 530. Predictably, learning the KLN 94 interface and procedures will take a few hours (especially under the Cone Of Stupidity), but after watching John use it as a backup for my steam gauge instrument approaches, it doesn't seem to have any odd quirks or surprises. I'll have to download the manual and absorb it properly for the next 2SP flight. But the really novel thing (for me) about 2SP is the KAP 140 single axis autopilot installed -- it's simple, easy to understand, and works a dream. John has me do almost the entire second time around the CCR LDA 19R approach with the autopilot coupled, switching between heading and approach mode as appropriate (with reverse sensing on the outbound leg before the procedure turn), and the results are an eye-opener. The ability to concentrate on maintaining altitude and monitoring the approach performance while not having to spend half your brain power keeping the plane stable is a godsend (hey, this is how the Big Boys do it!). Learning how to safely use an autopilot like this (and the various gotchas that come with it...) has to be a plus -- if nothing else so you can use it when the stress levels are up on a real IMC approach into unfamiliar territory. 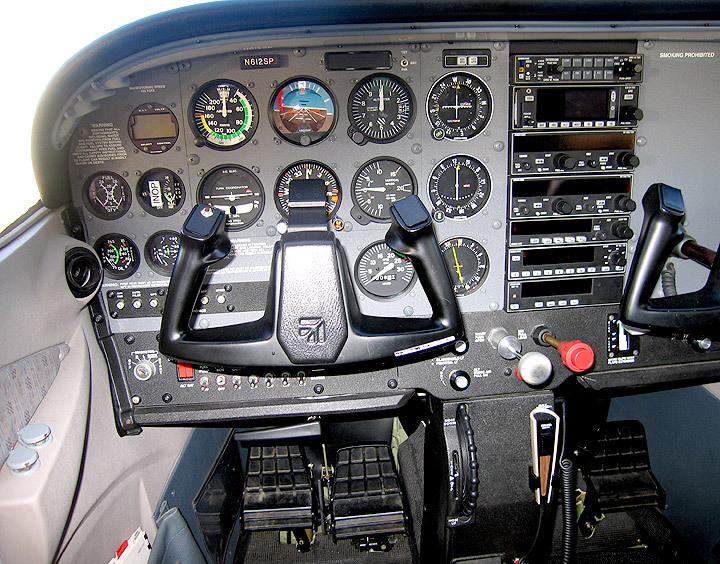 In any case, the PTS says that if I do the checkride in a plane with an autpilot, I must be able to show that I know how to use it properly (which strikes me as more than fair enough). Yes, some people are going to complain that I'll overuse it or that my own wing-leveling / heading control skills will wither, but like GPS, you have to be able to take advantage of new, proven, technologies where appropriate, and you just have to work to make sure you don't lose the other fundamental skills. It rained for a few days earlier in the week, and the ground's still saturated. So with the non-existent temperature / dewpoint spread and the drop from the daytime temperature of about 16C to 10C later in the evening, by the time we return at about 21.30 there's a thin layer of light ground fog developing over the airport. It's eerie -- from 100' up, on the approach, the air is crystal clear, the forward and downward visibility almost unlimited; on the ground, forward visibility is in some places only a few hundred metres. As we taxi back from refueling at Kaiser, the fog swirls thinly around us across the taxiways and aprons; by the time I leave the clubhouse 30 minutes later, the fog's become thick enough to be a real danger in places -- even though you can easily see the stars above. The layer's probably only a few metres thick. It's easy to see how tricky this effect -- very common in Northern California, especially the Central Valley, at this time of year -- could be on landing.